CHINE – Beidazhao Qiandong - Nearly 300 pieces of cultural relics have been unearthed from a cluster of ancient tombs in north China's Hebei Province. The tombs, located in Beidazhao Qiandong village of Nanhe County, 150 km south of the provincial capital of Shijiazhuang, are believed to be from the middle and late West Han Dynasty (206 B.C.- 24 A.D.) and middle Tang Dynasty (618-907), said archaeologist Li Lianshen. 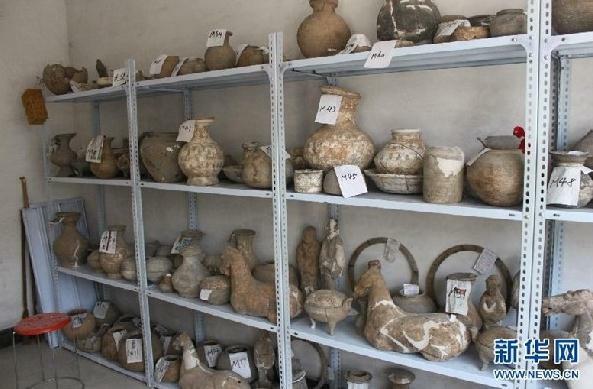 More than 4,000 square meters of land have been combed since the excavation started in May, and archaeologists have discovered 73 tombs altogether, Li said.Zhang Xiaozheng, head of the excavation, said the relics are mostly pottery, chinaware and bronze ware that were used in daily life. Zhang said the tombs are likely to belong to ordinary families judging from their shape and structure. About 10 more tombs are yet to be excavated, he added. 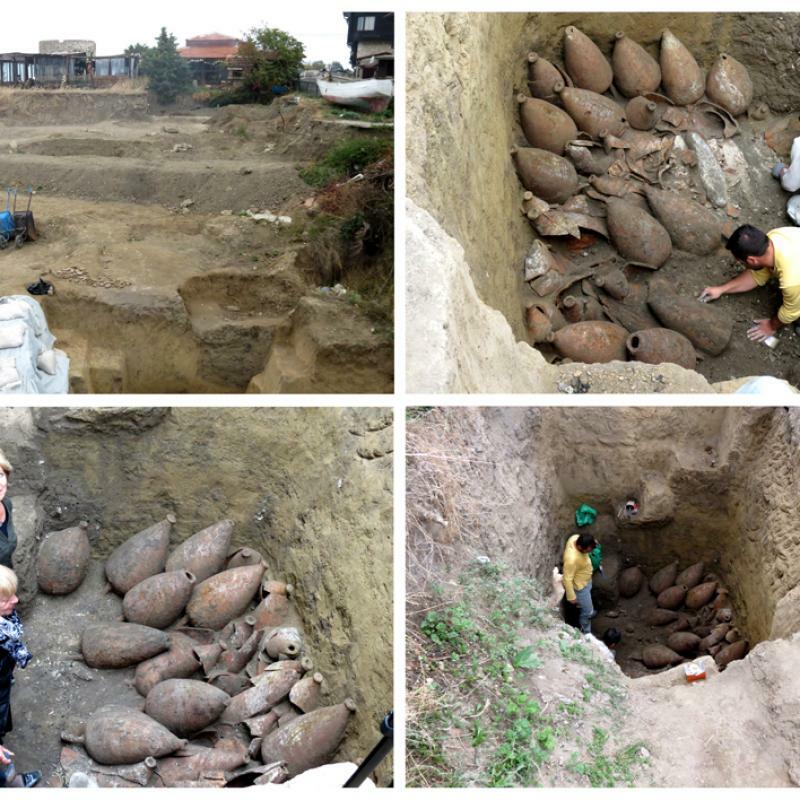 BULGARIE – Nesebar - A team of archaeologists, headed by Associate Professor Aneliya Bozhkova with the National Archaeological Institute with Museum with the Bulgarian Academy of Science, and Petya Kiyashkina with the Ancient Nesebar Museum, discovered a perfectly preserved cellar with amphorae from the V BC, over the last days of the archaeological excavations in the Bulgarian coastal town of Nesebar, the press office of Nesebar Municipality announced. The research is organised under a project of the Ancient Nesebar Museum, financed by the Ministry of Culture, with the participation of experts in archaeology. The ancient amphorae warehouse was dug in deep into the ground along the northern coast of the peninsula, which preserved it from the encroachment of time and the following cultural layers. The cellar is 2.60 x 2.50 meters big and belonged to a house, which was destroyed yet in the V BC. Archaeologists found more than 30 untouched amphorae – ceramic vessels for transportation and preservation of wine and olive oil. The amphorae are 0.70-0.80 centimetres tall. They used to be produced in big ancient Greek workshops and transported wine from prominent producers and importers, such as the islands of Chios, Lesbos, Thasos and others. SUEDE - Uppsala - Archaeologists in Sweden said Thursday they have unearthed the remains of unusually large wooden monuments near a pre-Viking Age burial ground.As archaeologists dug in preparation for a new railway line, they found traces of two rows of wooden pillars in Old Uppsala, an ancient pagan religious center. One stretched about 1,000 yards (1 kilometer) and the other was half as long. Archaeologist Lena Beronius-Jorpeland said the colonnades were likely from the 5th century but their purpose is unclear. She called it Sweden's largest Iron Age construction and said the geometrical structure is unique. "It is a completely straight line and they have dug postholes every 20 feet (6 meters)," she said. "They have had an idea of exactly where this line is going and where to build it. It is a fairly modern way of thinking and we don't have many traces of these sorts of constructions from that time." She said the pillars are believed to have been at least 23 feet (7 meters) high. 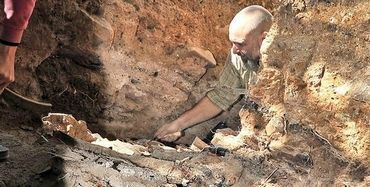 Bones found in some postholes indicate animals had been sacrificed there. Old Uppsala is known as a center for Norse religion, where believers gathered to sacrifice animals to gods such as Odin and Thor. The colonnades were found near a famous burial site where the three Iron Age kings Aun, Egil and Adils are believed to be buried. 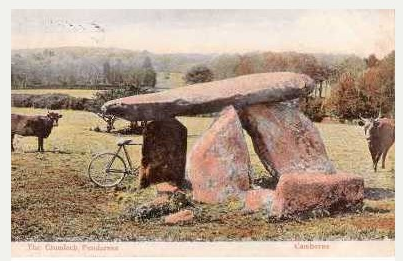 Beronius-Jorpeland said written testimonies from medieval times describe the city as a place for large pagan "blood ceremonies" and religious feasts. She said she believes there may be more colonnades in the area and archaeologists will continue to excavate and analyze the findings. ISRAËL – Tel Dor - Students from Haifa University are looking for evidence of two harbors at Tel Dor. The first harbor, used during the Bronze Age and the Iron Age, seems to have been located in Tel Dor’s south bay. There, archaeologists have found stone anchors and pottery. In Tel Dor’s north bay, they have found pottery from the Persian period along with stone anchors, and artifacts from the Roman and Crusader periods. ROYAUME UNI – Giant’s Quoit - Archaelogists are to finally start work on reconstructing Giant’s Quoit, a Stonehenge-like structure built 5,000 years ago by early man living near Camborne.Following three years of fundraising the ancient scheduled monument is being restored with final excavations taking place between October 21 and 31. INDE – Daundia Khera - The government is digging for treasure after a civic-minded Hindu village sage dreamt that 1,000 tonnes of gold was buried under a ruined palace, and wrote to tell the central bank about it.The state Archaeological Survey of India has sent a team of archaeologists to the village of Daundia Khera in Uttar Pradesh. They are due to start digging on Friday, Praveen Kumar Mishra, the head archaeologist in the state, told Reuters.Yogi Swami Shobhan Sarkar says the gold he dreamt of belonged to a nineteenth-century ruler, Rao Ram Bux Singh. He says he wants it in government hands to help India recover from an economic crisis.The archaeologists plan to dig two 100-square-metre blocks beside the palace. Mishra, however, warned that there was as yet no proof that any treasure lay beneath the soil of Daundia Khera village. "We are still searching for the exact location and whether there is any treasure. It is all in the future," he said. "We often just find pottery and metal antiquities, like agricultural tools or kitchen tools."